Most affordable loans in town! Bring us ANY TITLE - car, truck, motorcycle, trailer, boat, ATV, big rig and more. 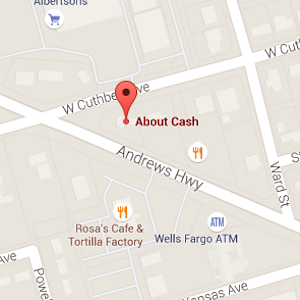 About Cash….a locally owned and operated company that will work hard to help you get the money you need! 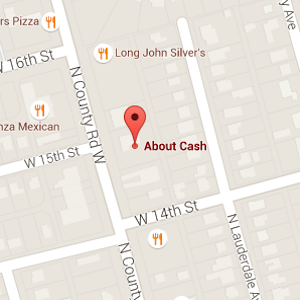 About Cash is the Permian Basin’s only locally owned and State Licensed Title and Payday Lender. As such, we are able to offer more creative and flexible loan solutions designed specifically for the needs of West Texas customers here in Midland and Odessa. About Cash has the fastest and most competitive service for Check Cashing customers and for those who are selling Gold & Silver. About Cash also offers many Other Services, so please call or stop by one of our Midland or Odessa locations today and experience the fast, friendly service you deserve! Need cash fast? We loan on almost any title and we buy gold and silver. Trade with the home town company that serves you right here in Midland and Odessa, Texas.